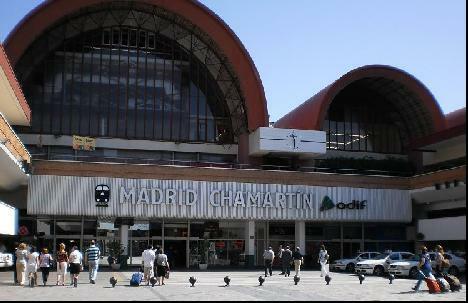 Chamartin is the second and almost equally important train station in Madrid. Located in the North of the city trains depart for the North of Spain and France from its extensive 20 plus platforms. In addition to the national and international routes the same station affords connections to the regional Cercanias network and Madrid Metro via elevators and escalators. As one of Spains principal train stations Chamartin offers connections throughout the country and even Internationally via a series of different types of trains and levels of comfort. With the downtown Madrid train station at Atocha covering routes to the North East, Central and Southern Spain Chamartin traditionally covers routes to the North West and West of Spain. The newly inaugurated connecting tunnel between the two has seen a series of the services becoming "through trains" stopping at both stations. This is typically the case with Alvia and Avant trains that connect Northern and Southern Spain with exotic routes such as Pontevedra to Alicante or Gijon to Valencia. Asthetically Chamartin station is one of those concrete eyesores that looks, albeit only "looks", like it should have been torn down long ago and replaced by something a lot more elegant. What it doesn't have in looks it makes up for in pure functionality with the distance between enterance and platforms being just 5 minutes. Underground passageways also interconect the platforms so connecting passengers need not pass through the station concourse unless connecting involves a long wait or indeed if its cold. All platforms are at street level so to enter the main station concourse where the ticket offices and travel agents are located the voyager has to first ascend either the stairs or the gentle ramp to the 1st floor. This is the same place that bus and taxi stops are so if arriving via these means there should be no inconvenience. For disabled access the station is equipped with elevators accessing all platforms and the central area. If your connecting time is more than a couple of hours a short walk will take you to the Plaza de Castilla which offers shopping and eating establishments as well as the famous inclined towers which lean towards each other above the roundabout. Those visitors with longer connections can even travel into the city center allowing 40 minutes in each direction via the Metro. Located approximately 10 minutes walk or 3 minutes by Metro from Chamartin station is the Plaza de Castilla bus station from which regional and National bus services depart. If the train fare looks expensive then the bus / coach is normally around half the price depending on the route / destination. Whilst Chamartin might be your first point of call it is located in the "new" business / financial district of Madrid and as such offers little in the way of tourist or visitor sights. Therefore unless you have an early morning departure or late arrival its better to find accomodation centrally in Madrid rather than close to the station itself. The quickest and easiest way at present is to take line 9 on the Madrid Metro to station Colombia and change there for the line to the Airport. Allow 30 minutes for the total journey. We say at present as in 2012 it is intended that a high speed dedicated link to the airport will be inaugurated, provided that for once things are completed on time!